While former FBI Director James Comey was testifying about what a repugnant liar Donald Trump is, the remainder of the Senate was working feverishly to ram through a repeal of Obamacare and replace it with Trumpcare. Congress will effectively take away health insurance coverage from about 23 million people. The Republican Congress will ensure that health care is taken away from its constituents in silence and under cover of night or diversion. The replacement will be garbage. As Mr. Comey explained that he leaked information about his conversation with the President, the right wing howled. But Trump had already “leaked” details of those conversations in the letter firing Comey. In any event, at the time, Comey was a private citizen describing non-classified, non-privileged information. After all, the other person in that conversation had already revealed details from them in an open setting. Lordy, I hope there are tapes. 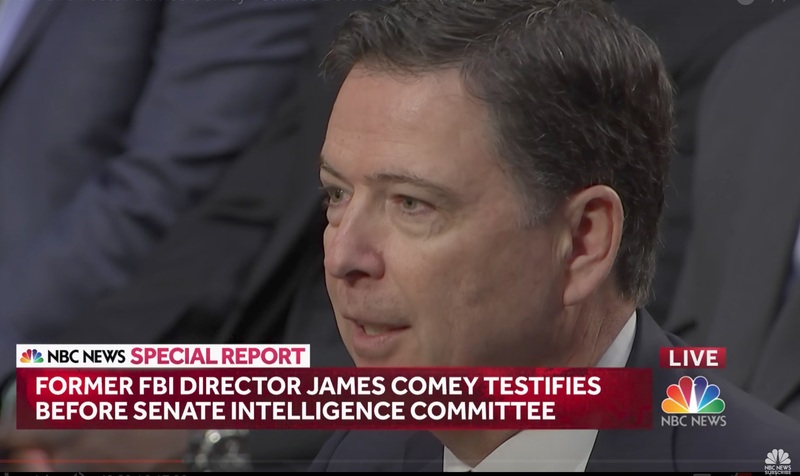 As Mr. Comey detailed how President Trump pressed him to drop the investigation into former National Security Advisor Michael “Lock her Up” Flynn, Republicans whined that Mr. Trump was too ignorant to realize that he was obstructing justice or violating the FBI’s independence. While Republicans claimed in sound bites and memes that Comey finally put the Russia collusion allegation to bed, they must have not been paying attention. COTTON: Let’s turn our attention to the underlying activity at issue here. Russia’s hacking of those e-mails and the allegation of collusion. Do you think Donald Trump colluded with Russia? I wouldn’t put down those Matryoshkas just yet, comrades. Trump fired Comey on May 9th, soon after Comey refused to pledge his personal loyalty oath to the President and to drop the Flynn investigation. In the wake of the 2008 global financial meltdown, Congress decided to pass legislation that would help prevent a recurrence. The Republican House voted to repeal that bipartisan law — Dodd Frank — while you were watching James Comey give his powerful testimony. Part of Dodd Frank involved protecting consumers. For some reason, that is anathema to Congress nowadays. While your Republican friends are wrongly claiming that Trump has been vindicated, Republicans are chugging right along towards rolling back the Medicaid expansion. This expansion ensured that millions of working poor families could obtain health coverage. While Washington plunges into a dark age of punitive dysfunction, everyone should be paying very close attention indeed to what just happened in the UK. After almost a decade of austerity and cuts, the Tories lost their majority to a Labour Party led by Jeremy Corbyn, whose politics are closer to Bernie Sanders than Tony Blair. It was a dramatic and wholly unexpected defeat — Theresa May had called this snap election in order to grow her majority and earn a mandate going into Brexit negotiations. To say that didn’t work out as she intended is a dramatic understatement.